MelinaMay – leading online stock outlet for the Greek market. (-) There are actually two emails from Saks in my inbox. That is too much given that I have never ever purchased anything from Saks. Saks should have segmented me as an inactive user, tested multiple messages on that group and then send the best performing one to all inactive users in hope that the maximum of inactive users will convert to paying customers. Two emails on one day is a sure sign that Saks has not thoroughly tested those messages and also, as a recipient, I realize that these messages are not anything special that deserve my attention more than any of the previous messages I have been ignoring. (+) Sender: varied sender helps as it differentiates the two messages and makes recipients think that the message actually is sent from two different sources – reduces the feeling of getting spammed. (+) Positive marks also on correct targeting, serving me messages for males while indeed I am a male. (+) Top message has a fairly effective title kicking off with a most impressive 70% discount. Also makes clear that it refers to male products. Not so keen on the Must-Haves descriptor which is too vague and hence conveys no real info. (-) Negative marks for the descriptor below the title especially for the top email, which repeats the Sender and then reads like random text without any coherency. The bottom email reads a bit more logically but still it feels like an AdWord campaign unsuitable for a personalized message to an already subscriber. (+) The descriptor is ok as it reads as a logical text and provides brief product descriptors and brands that could engage recipients. (-) Negative marks for the topic of the email being only a CSR message (= look at us how great we are) offering no real incentive to read it. The correct implementation should include an invitation/ CTA on how the recipient can help or maybe what the Kotsovolos Dixons customers have already done to contribute to this good deed. 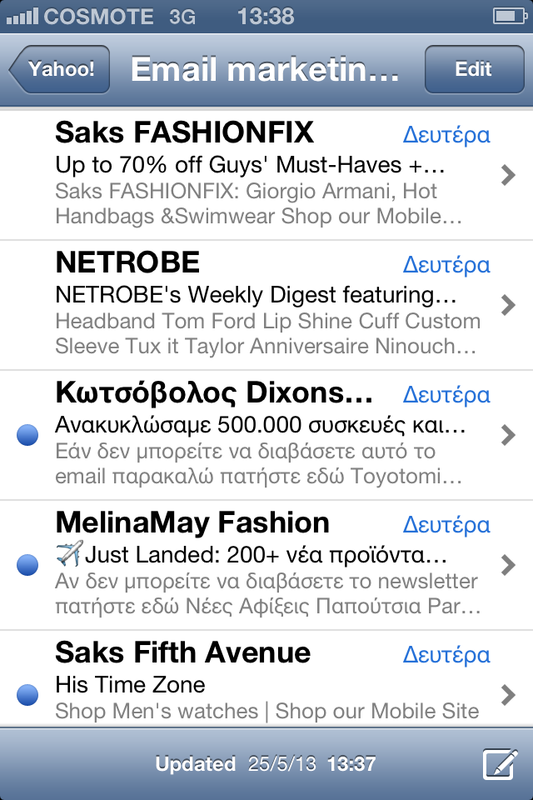 (-) Big time negative marks for having left a generic text as a descriptor – Kotsovolos Dixons must have never paid any attention to the mobile inbox. (+) Positive marks on using favicons in the title and especially in the start of the title. A sure way to boost engagement. Also it matches well with the title’s copy which is always a plus. (+) Good use of character real estate informing recipients that new items have arrived. Important incentive for the bargain hunter to read the email and find out what type of products came in. (-) Missed opportunity to use the descriptor below the title to outline some of the product types, brands etc. that just came in. Got any other comments on the emails showing in the photo or disagree with any of the points, feel free to say so in the comments section. If you search for 1 to 1 marketing you will get results such as personalization, CRM technologies, userbase segmentation and so on. Before you go there and invest in a software or recruit an agency, first identify the principle behind all of those buzzwords and try applying it in your email marketing. The juice: make the recipient feel like this message is intended to him personally rather than give him the i-am-bulking-everyone-i-have-access-to impression. The more relevant the message, the higher the probability that the recipient will become engaged upon receiving it. That’s the juice. -make the content of the message as relevant to the recipient as possible. One way to achieve this is through userbase segmentation. For example, segment in a list users that purchased a specific product and prepare a custom message for them only. Or make a list of customers that spent more than 100 Euros the past 15 days. -be explicit in what you are doing. If you did segment your users and you are now addressing a specific segment of those, tell them so. And do so as early in the message a possible (see benefits of cutting to the chase). For example, “You have spent more than 100 Euros the past 15 days and that places you in our Golden Club and eligible for a unique offer…”. -make copy personalized. The trick here is to make all copy seem as if it is written for this recipient only. This does not mean you need to change your brand’s tone of voice, no just imitate how a company representative would address a customer. To go a step further, you can make the message more personalized by addressing the recipient by his or her name (most email marketing software allow this functionality), explicitly explain why the message is relevant to the recipient, or even better make evident how this message is exclusive for the particular recipient. -be polite. In 1-to-1 relationships manners matter more. Some examples: don’t try to trick them, don’t make unsubscribing difficult, don’t enroll them in the mailing list without their consent, don’t lie, etc. I believe the main pillars on how to make recipients feel special are here. Do all of the above and you will get 90% of the benefits a 5,000 Euro/ month CRM system could offer you. Have you found another trick in order to make recipients feel special? Please write a comment about it.